Even if Halloween is in two weeks, I love tombstones. This one I find particularly intriguing: it is strange to think that a tombstone can be reused, but that what’s happened in Ayyubid period. The tombstone is kept at the Metropolitan Museum, New York (acc. num. 2010.225) and contains some valuable information over the periods it concerns. 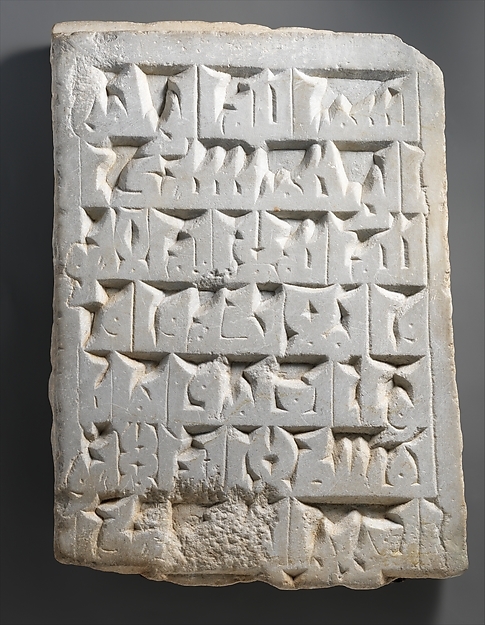 The Fatimid period tombstone, dating back to the 10th century, is carved in a beautiful, simple and thick Kufic, most typical of the period in Egypt. The content is pretty common to tombstone either: after an opening basmala, the text comprises a Qur’anic quotation widely used in funerary steles, Q 3:18, that by the way do not refer specifically to a funerary context. The quotation stresses the basic concept of the tawhid, uniqueness of God. The inscription reads: “In the name of God, the Merciful, the Compassionate [basmala] – Allah witnesses that there is no deity except Him, and [so do] the angels and those of knowledge – [that He is] maintaining [creation] in justice. There is no deity except Him, the Exalted in Might, the Wise. [Q 3:18]”. The last word, al-hakim, appears to be ruined and considering its length, it is possible that was followed by another word. In the museum website it is not written whether the tombstone is complete. It is true that it lacks a date and the name of the commemorated person, and that they can be considered to have been in a lower missing part of the stele. In this case, it would be maybe possible to read the word هذا, this, usually introducing the phrase “this is the grave of…”, commonly found in tombstones from the Mediterranean area. Moreover, the bottom line is not framed as the other three margins. Also this can lead us think that the gravestone broke at some point. When turning the tombstone, we find another beautiful inscription, upside-down if compared to the previous Fatimid part. In this case the text displays a slightly cursive script, much used during the Ayyubid period. Together with this, the epigraphic content is arranged within a two-dimensional niche, displaying on its top a lamp. The pair “architectural niche+lamp” is not to be interpreted as a mihrab in itself. Actually studies have underlined how the two-dimensional mihrab is more related to a commemorative dimension that to a ritual one. The text is clearly arranged to fit and completely fill the architectural niche. It is also interesting that the alif of the word Allah is detached from the rest of the word. The vertical strike of the alif is at the right of the lamp, whereas the one of the lam is on the left of it. Under the lamp we find the horizontal line of the sin of the word bism. This arrangement of the letters give the impression that the space reserved for the image of the lamp was accurately “prepared”. In this case the inscription is patently complete: under the bottom line there is a wide empty zone. 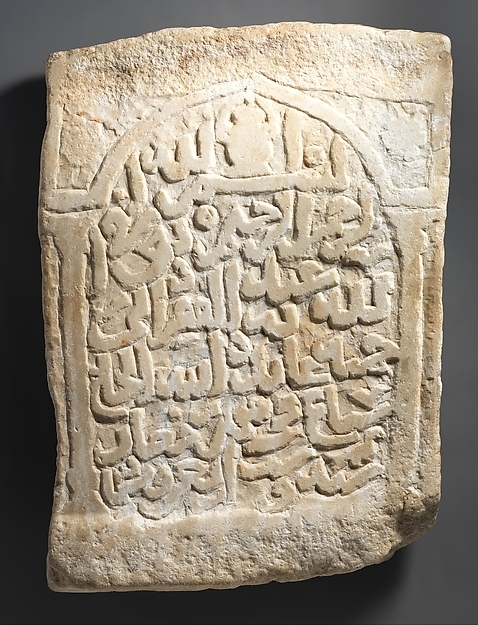 This, together with the fact that the Ayyubid inscription is upside-down, when compared with the Fatimid part, would mean that when the Fatimid gravestone was reused, it was already damaged. It is translated (basing on Sheila Canby’s work): “In the name of God, the Merciful, the Compassionate [basmala]. The servant of God, the one needy of God’s mercy, bint al-Haj Saba’ [? ], died in the month of Ramadan, the year 646 [December 1248-January 1249]”. Generally speaking, reusing gravestones is not really nice. In this case, anyhow, it is interesting how this funerary stele(s) can lead us to general consideration. First of all, we can compare the accuracy of the calligraphic part. Who produced the tombstones? For whom? Well, from my point of view, the difference in the way the calligraphy has been delivered is striking. In the Fatimid Kufic part, we see a beautiful style, simple but absolutely clear and accurate. The stone surface has been smoothed in every part: not only the words, but also the background and the frame; the carvings are carried out attentively. The Ayyubid side is not so accurate, neither in the composition nor in the finishing. The overall composition does not seem to be as accurate as one can expect: the architecture design is not perfectly carved and the lines are not always straight. The surface is not smooth, particularly in the background. The decoration on the top corners of the niche is only sketched and the upper and lower zones, beyond the niche are not treated. Also the flaw of the text and the way it is carved do not seem particularly accurate, even more if it is compared with other Ayyubid inscriptions of the period that employed the same script. Well, what can be said from this preliminary remarks? First of all that the two people using this tombstone, one during the Fatimid period and the other during the Ayyubid one, had probably a really different social status. The family of the first could afford a beautifully carved tombstone, delivered by an expert calligrapher and expert carver. The 13th-century family otherwise probably could not or did not want to. Also, they decided not to use a new piece of stone, but to reuse a previous (broken?) tombstone. With this difference in mind, the choice of the textual arrangement is even more interesting: what the side B tell us, is that in the first half of the 13th century, such a design for a funerary stele must have been pretty common or desirable. Also, the link between the pair “niche+lamp” and the funerary context was pretty spread and popular. As a conclusion, I simply want to underline (one more time) how an inscription cannot be read only and solely for its content. An inscription, as the book Writing as material practice edited by Kathryn Piquette and Ruth Whitehouse points out, must be read as part of the context that produced it. An inscription should and must be read as multi-layered documents, that is not limited to the textual part but also involves aspects as the patronage, the intended public, the calligrapher, the worker that carved the inscription… and other personalities that had a more or less important role in the production role. This double-sided tombstones maybe can help us better understanding the changes that occurred to the writing process through times. The end lies in the beginning / The embryo is hidden in the seed. / In the sphere of Time we move in circles / To let the two ends of life meet. You will understand the perfection of life / Only when it has changed to death / In a little graveyard where autumn leaves fall / And tell-tale tombstones recount history. Life is a song nearing its end, / Freezing into pine green and stillness of the grave, / Which is not annihilation. With death as a cover / It gives you the meaning of life’s perfection. -Zeng Min: Pre-revolutionary Chinese poet, from: “The Call of the Trumpet”: An Anthology of Twentieth Century Chinese Poetry, Selected, translated and with an Introduction by Ahmed Ali, Embassy of Pakistan, Beijing, 2012.